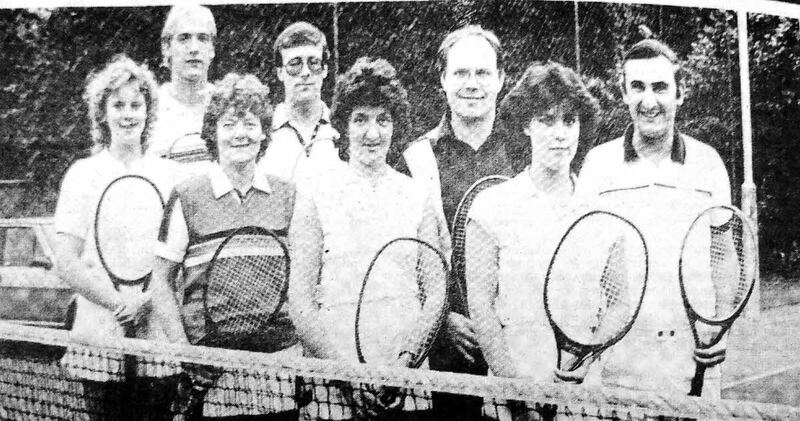 THE Star reported in 1985 that Stirling Moss was set to return to Dundrod as part of the diamond celebrations for Ulster's senior motor club UAC. Stirling first attended Dundrod in 1950 when he won the Tourist Trophy driving a Jaguar XK 120. The plan was for Moss to drive that car at the August celebrations. POLICE were alerted to 'ton-up' kids who were terrorising motorists around Lisburn in i 1969. The Star reported they were racing each other in built up areas and on the main roads. 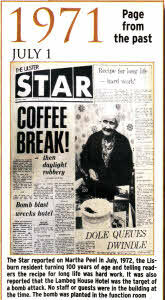 Readers had complained to the Star and police were on the look-out for the culprits. FOUR police constables and a housewife rescued a bullock which had got into a manure pit at Lisnastrain in May, 1971. The Star reported the bullock was almost submerged in the manure when the rescuers arrived. The police got a rope from a local farmer and put it over its head. Along with the woman, the police then were successful in pulling the stranded animal out of the pit. Only for the prompt actions of those who attended the scene the bulllock would have died. A LISBURN teenager was preparing for a trip of a lifetime to Israel back in May, 1969. Liz Boyd, aged 19, packed in her job and said goodbye to friends and family as she set off to work in a communal community called a Kubutz with 400 Israelis and other nationalities. Liz revealed to the Star: "I went to Kibutz a year ago and it mattered to them I was there. They needed me. I have got a one way ticket and don't know how long I will be there. "It's a big step for me to take, but it is one a must make," added the secretary from McCready's Rose Gardens in Derriaghy. In the Kibutz Liz was to share in the domestic and manual work along with other volunteers from America, Canada and other European countries. After flying to London, Liz was set to travel to Marseilles to catch the SS Apalionia which would take her to Haifa. "Later, perhaps, I will go to work directly with Arab refugees or do hospital work. Living beside a reservoir has been hectic in recent weeks and with helicopters landing in the garden I'm looking forward to some relative peace in war locked Israel." WARTIME memories were revived in Lisburn in May, 1985 when Lisburn celebrated the 40th anniversary of the liberation of Europe, VE Day. The Ulster Star reported that veterans who fought to achieve victory would parade through the town and then attend a special wreath laying ceremony. The parade and a beating of the Retreat ceremony in Smithfield Square was being organised by the Lisburn Branch of the Royal British Legion. The Lisburn Old Comrades were invited to attend in Belfast events but decided that such a unique occasion deserved a Lisburn celebration. John Reid, public relations officer of the town branch stated in the Star; "The people of Lisburn faithfully support our Poppy Day appeal and we felt a special effort should be made not only to honour our War dead, but those who have helped make it a happier peacetime for the survivors." There was also a pre-VE Day Ball planned for the Legion Club which a special commemoration at midnight to mark the historic day in 1945 when for the first time in six years peace reigned over Europe. Civic leaders along with Lisburn Mayor Maureen McKinney were to attend the wreath laying ceremony planned for the following week. 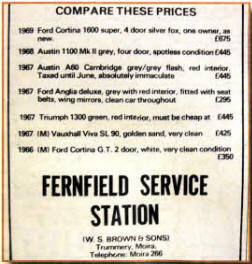 Pity these car bargains are not on offer today - a guide to what we were paying back in late sixties. LISNAGARVEY Hockey Club were set to remain in the Senior League after picking up a vital point in a scoreless draw with Antrim in May, 1969. It was their eighth draw in 14 games and left them with 10 points, just two ahead of bottom placed YMCA. A MISSION by international evangelist Billy Graham held at Sheffield United's Football Ground in 1985 was to be beamed back live to Lisburn. The relay was to be set up for local churches in the area. Dr. Billy Graham was reported to have preached to over a million people in a similar event the previous year.